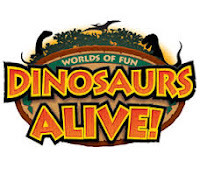 Welcome to Dinosaurs Alive at Worlds of Fun. Deinonychus (small dino on back). Tentosaurus (the dino about to get ate). This is a great exhibit and nice way to get away from the crowds at the park.